From Orlando we move even further south to Singer Island. On this coastal island you will find 3800 Ocean, which is located within Palm Beach Marriott Singer Island Resort & Spa owned by Urgo Hotels. In addition to enjoying beautiful seaside views, you will also find yourself amazed at the fabulous cuisine here, which is part of their all new Collaborative Kitchen menu. 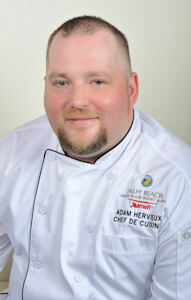 To learn more about the menu at this restaurant, I spoke with Chef de Cuisine Adam Hervieux. A native of New England, he joined the 3800 Ocean team this year. Having graduated from the Culinary Institute of America in 2000 and also having worked for Chef Todd English at Kingfish Hall in Boston, he brings a great amount of experience and knowledge to this restaurant. TT: Can you explain what the Collaborative Kitchen menu is? CH: It is a unique approach to dining with a collective menu that is produced by the entire culinary staff, highlighting chef specialties and culture. CH: Our menu is completely new. CH: Pan Roasted Grouper – this dish is one of our signature menu items. It is served with potato – artichoke hash, blue crab remoulade, and sweet herb broth. CH: We use Florida black grouper, and we source locally as much as possible including produce from Swank Specialty Produce’s hydroponic farm. CH: Through the end of summer. CH: When we create a menu we really concentrate on pairings and what items have synergy to make a dish that is as complete as it is satisfying; seasonality also plays a big part. We believe our kitchen concept is a reflection on our menu offerings and as such makes us a unique choice. It’s not very often that you find a menu with as much diverse influence. Our team really defines who we are as a restaurant.